RIP Admission for 1 (one) guest to the 3rd Annual "Heaven & Hell" Bar None Halloween event on Saturday October 26. The East Village is never a disappointment on a night out in the city. So what better time to visit than Halloween? 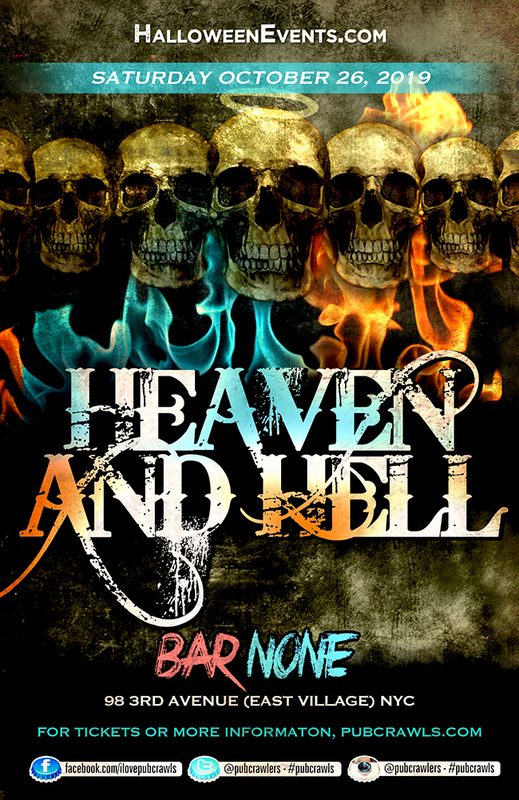 The annual Heaven & Hell Halloween takes hold of Bar None, located at 98 3rd Avenue, on Saturday, October 26th. Goons, goblins, witches and even Superman may show up! This is the time of the year when you can dress up like whoever or whatever you want and you look completely normal on the street, especially in Manhattan! Bar None is a local hot spot and is known for their hospitality, well-priced drinks, and an awesome party crowd. Heaven and Hell begins at 8PM and we go all the way until 4AM. Get a real glimpse of Halloween in NYC when visiting Bar None because this type of experience should never pass you by. Call your friends and spend this year's Halloween at Bar None!